By 1917, the Imperial Russian postal service operated a couple of hundred post offices in the Guberniya of Podolia. A few were in the main towns - Kamenets, Vinnitsa, Zhmerinka, Proskurov - but most were in small towns. If you Google those small towns, most of them show up on Genealogy and Holocaust sites as Jewish shtetls. Between 1918 and 1920, stamps in the post offices changed as the Ukrainian National Republic introduced the General Issue of 1918 and later in the year the Trident overprinted stamps. But the old Imperial cancellers remained in use. I know of only one distinctive new canceller - and that was introduced by the Polish during their occupation of Kamenets Podolsk in 1920. They produced a canceller with Polish spelling (KAMIENIEC) - this is illustrated in the Fischer Catalog Tom II and on this Blog - click on the Label at the end of this Post to link to the relevant page. There is also a Kamenets canceller with Ukrainian spelling (KAMYANETS) but this is a Forgery. Though similar in style to Imperial Russian cancellers, it appears to have a fixed date 19. 7 19. It is only found on cancelled to order stamps, some genuine and some forged or doubtful. The ink used for all cancellations is different to the inks generally used in Podilia during 1918 - 20. Here are some examples of the cancellation. At the top it is applied to a genuine 20 Hr General Issue, a genuine type 3 Kharkiv Trident and a genuine type 1a Podilia Trident. Then at the bottom are two examples of Podilia 1a in violet or violet-black ink. These are usually regarded as Reprints or Forgeries though the discussion in the Trident literature is pretty perfunctory. 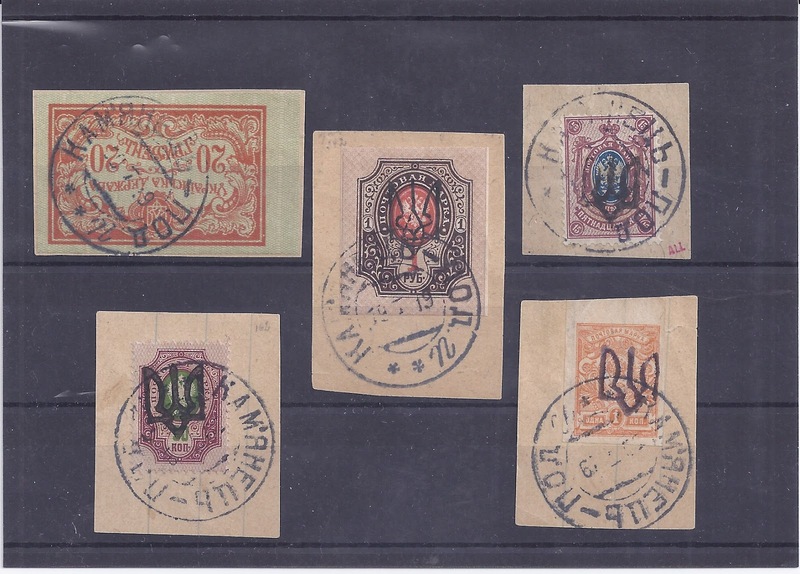 Top left: Genuine Podilia 1a on 50 kopeck with what I take to be a forged cancel of Zhmerinka Voksal. The genuine cancel is oval in the usual Imperial style and rarely seen at this time, though I have one example on a General Issue stamp. Top centre: Genuine Kyiv III with what I think is a forged GORODOK POD. cancel. I don't like the general appearance, the ink, the circles instead of stars and the date 10 7 18, well before any Trident overprints appeared - the earliest known dates are at the end of August. 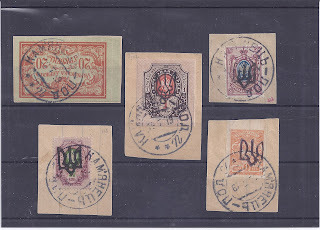 Bottom row: Genuine Kyiv II and Podilia overprints, mint with full gum, cancelled with what I take to be a forged Ukrainian Field Post cancellation. 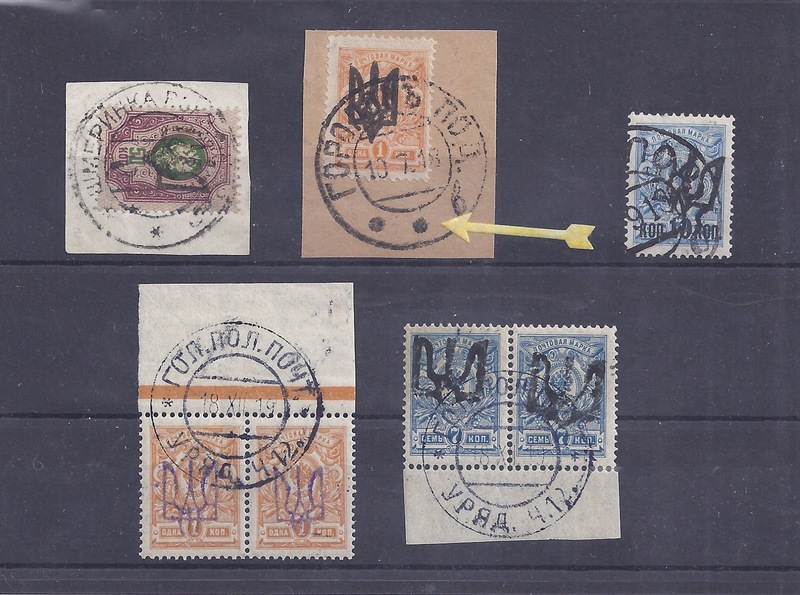 The complete text of the cancel can be seen by looking at both pairs of stamps. The date 18 XII 19 on both items allows a remote possibility that this is a genuine cancel. One other thing: I have had some kind of collection of Podilia postal history for 1917 - 1921 for over twenty years. But - apart from the stamps - it does not feel very Ukrainian. The cancellations are in Russian and it may be that the employees of the post offices were mostly Russians or at least fluent Russian speakers. All their paperwork was in Russian (except at Yampol where the postmaster printed his own Ukrainised Money Transfer forms). Letters to the Courts are addressed in Russian. I suspect that most of the people who used the post offices identified themselves as Russian or Jewish - and from Googling, it would seem that Jews tended to use Russian rather than Ukrainian when they were not using Yiddish or Hebrew. Am I wrong about this?